On Saturday at the Sam Boyd Stadium in Las Vegas, a packed crowd witnessed motorcycle racers competing for the cup in Monster Energy Cup 2018. To add icing on the cake, if a racer won all three races for the main event, they would get a million dollars. And what a treat it was with Monster Energy Kawasaki rider Eli Tomac winning the cup and winning all three races. 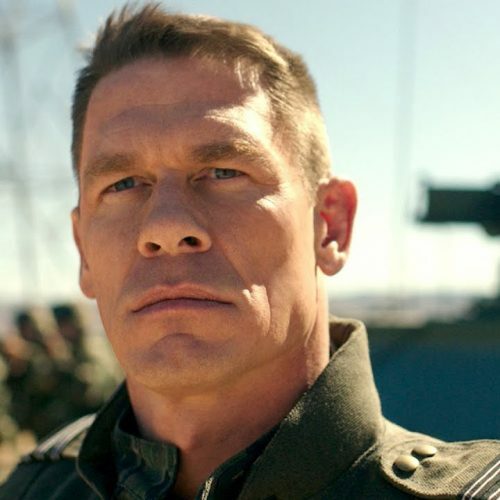 It’s fitting since Milestone and Feld Entertainment have announced Monster Energy Supercross – The Official Videogame 2, and the announcement trailer features Tomac. It’s definitely a win for Monster Energy. 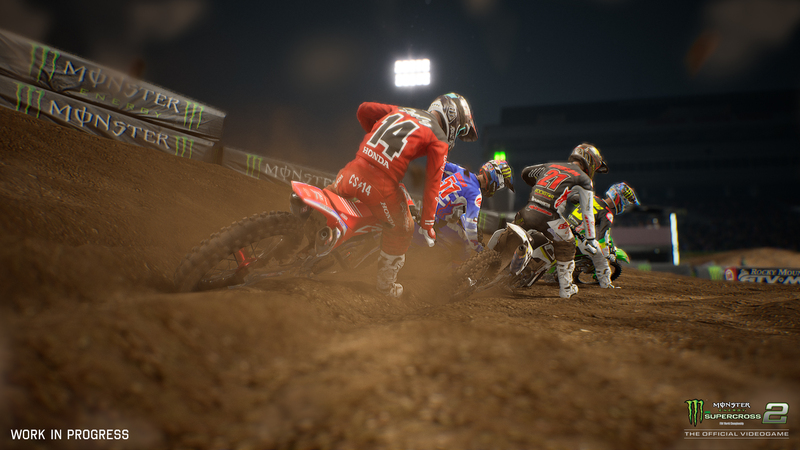 Monster Energy Supercross – The Official Videogame 2 will have gamers experiencing the intense races as a Supercross rider from the 2018 season. It will feature career mode, track editor, training compounds and more. With the career mode, you can customize your own professional racer with different faces, physical appearances, and accessories. You can also customize mechanical parts for your bike. The Track Editor returns, and you’ll be able to customize your own track and share it online with other players. With your very own personalized racer, you can attract sponsors and fans, deal with rival racers and handle media relations. There will be four new tracks for practicing your racing skills along with events and activities to attend. As for the 2018 season, there are over 80 official racers to choose from including Jason Anderson, Marvin Musquin, and Eli Tomac (this marks his first appearance in the video game). There will be 17 tracks available at launch including the NRG and Raymond James stadiums. We had the chance to play the preview build, with the racing and training compound modes being available. There are many riders to choose from, and if you’re new to the scene and are wondering who to pick, sadly, there won’t be stats available like in other sports games. With that said, each rider is unique in terms of skills, so if you’re familiar with the riders, then it shouldn’t be a problem. There are a few tracks available including Las Vegas’ Sam Boyd Stadium. If you’re familiar with the Supercross game, you should be able to jump right in, but Milestone has made updates to the riding mechanics. If you’re new, then it’ll definitely take some time to get accustomed to the controls, especially since the developers have aimed to make it more accurate and realistic. Monster Energy Supercross – The Official Videogame 2 has a lot of options for controlling your vehicle. With the mechanics being more realistic, it means players will have to learn to brake, turn, lean and accelerate. Yes, leaning will give you an edge, so it’s recommended to do both leaning and turning with the left and right stick. It’s kind of like rubbing your belly and tapping your head at the same time since you’ll also have to use your fingers to control your speed. Since this is Supercross, racers will encounter obstacles of all types including sharp turns, triple jump, dragon’s back, whoops and more. Riding on the tracks will be difficult for a beginner, so it’s important to learn how to jump and land, or else you’ll crash a lot. Luckily, there’s the rewind mode that will help you learn from your mistakes. To make things easier, there is the Dynamic Flow Aid to help assist you in timing your jumps and landings. 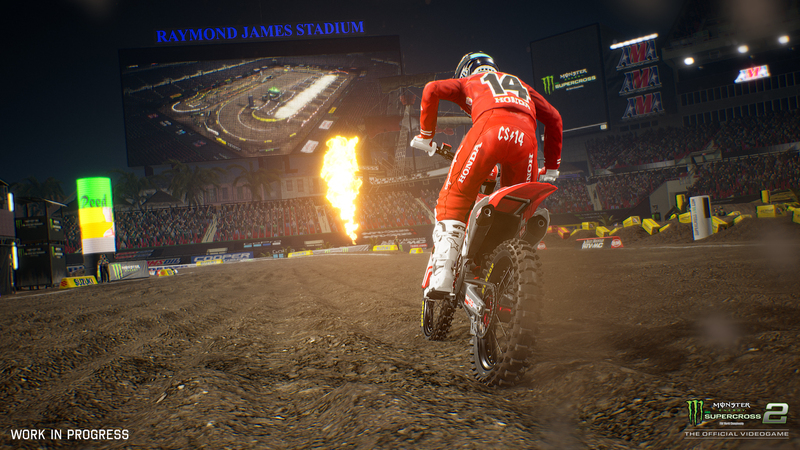 The game’s presentation is dynamic with stadium effects and racers attracting dirt from the ground. You can even pause the races, which allows you to check out the details by moving the camera around. A Monster girl can be seen walking the track before the start of the race. The game is developed by Milestone, a studio based in Milan, Italy, and is known for working on games like MotoGP and Ride. 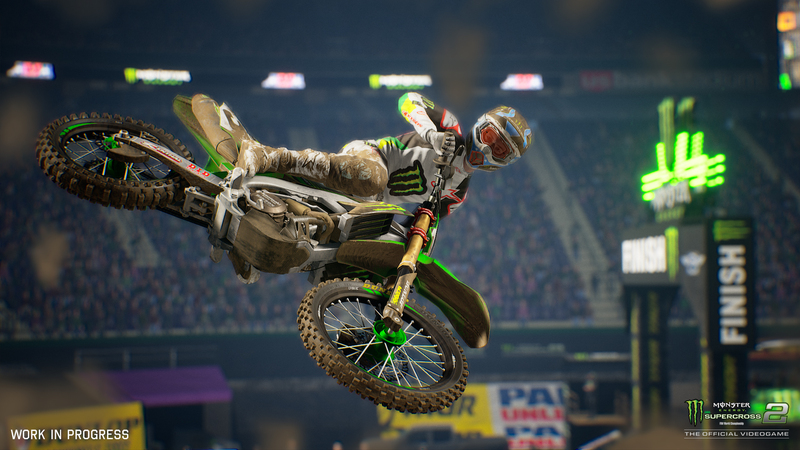 Monster Energy Supercross – The Official Videogame 2 will be available on February 8, 2019, for the PlayStation 4, Xbox One, Nintendo switch and PC.